The purpose of this review is to discuss the pathogenesis, clinical manifestations, diagnosis, and treatment, including areas of controversy and uncertainty. Central apnea may be due to hypoventilation or to hypocapnia following hyperventilation. The occurrence of central apnea initiates a cascade of events that perpetuates breathing instability, recurrent central apnea, and upper airway narrowing. In fact, breathing instability and upper airway narrowing are key elements of central and obstructive apnea. Clinically, central apnea is noted in association with obstructive sleep apnea, heart failure, atrial fibrillation, cerebrovascular accident tetraplegia, and chronic opioid use. 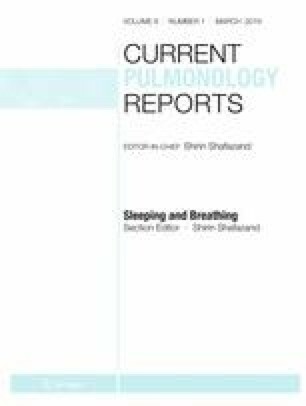 Management strategies for central apnea aim to eliminate abnormal respiratory events, stabilize sleep, and alleviate the underlying clinical condition. Positive pressure therapy (PAP) remains a standard therapy for central as well as obstructive apnea. Other treatment options include adaptive servo-ventilation (ASV), supplemental oxygen, phrenic nerve stimulation, and pharmacologic therapy. However, ASV is contraindicated in patients with central sleep apnea who had heart failure with reduced ejection fraction, owing to increased mortality in this population. There are several therapeutic options for central apnea. Randomized controlled studies are needed to ascertain the long-term effectiveness of individual, or combination, treatment modalities in different types of central apnea. Shahrokh Javaheri reports fees from Respicardia as a consultant. M. Safwan Badr declares no conflict of interest.